If you are an owner’s representative planner you may have a difficulty to integrate contractor’s schedules into your integrated schedule. There are two ways of schedule integration; (1) Using Copy and Paste Activities (2) Update to an Existing Project. 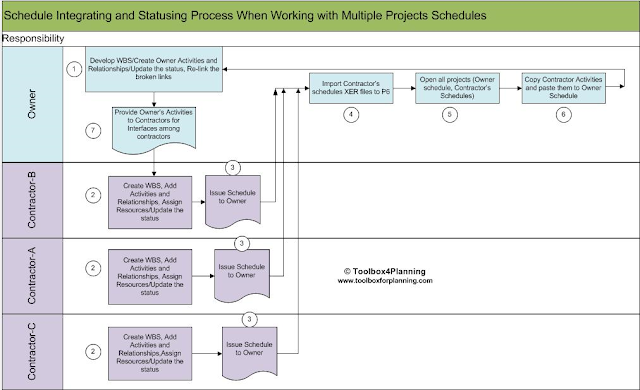 Integrating schedule developed by contractors may not be easy if the WBS structures are different from your project. If all the WBS Codes are the same, it can be imported and updated easily. If it doesn't exist, multiple schedules developed and updated by contractors can be integrated into your schedule using copy and paste activities in P6. Once the project progresses, the new information might be added to contractor’s schedule due to changes of sequences for some reason. It is typical that contractors would issue the revised schedules during project execution. The revised reschedules can also be integrated into your schedule by copying WBS from the contractor’s schedule and pasting into your schedule. 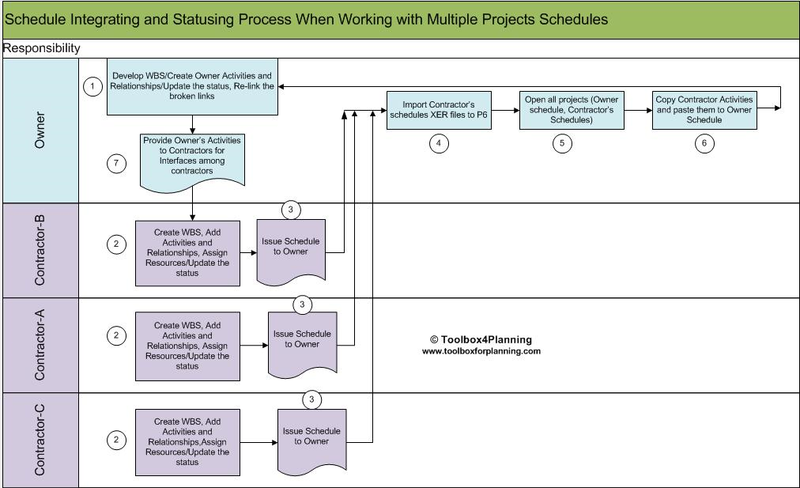 The following diagram shows the process of work flow when multiple schedule are integrated into one. Suppose your schedule containing owner’s activities has been developed (Step-1) and the three contractor schedules required to integrate into your schedule have been issued to you (Step-3). Step-4 Import Contractor’s schedules XER file to your database. 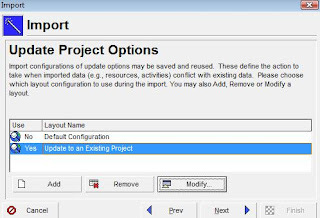 When starting importing new file to your database, In the Import Project Options dialog box, choose Create New Project option under Import Action field. Click on the Import To field to select the EPS location that you want to import. Select Default Configuration in the next dialog box Update Project Options. Click Next and then Finish the importing process. To open the all projects, select all projects that you want to open. Right Click and select Open Project. Suppose you have Project A, Project B and Project C and Integrated Schedule (your schedule) as shown in the following figure. And Go to the WBS and see the WBS structures of projects. You will see WBS structures of contractor are not the same as yours. The following figure shows WBS structure before integrating activities. Click on the Project A, Right click and then Copy Project A and paste it to the first level (Integrated Schedule). Repeat the same for the Project B and C. You will find the new WBS copied from new projects as shown in the following figure. Go back to Step-1 to do the necessary links among the projects. Finally you will see a stand alone integrated schedule containing all contractor’s activities. Remember to reassign project calendars to contractor’s activities if their calendar’s specifications are different from global calendar. The default calendar will be assigned into contractor’s activities by default when the activities are being copied from their projects. After completed, assign the baseline and make a back up copy of the integrated schedule. When you have new information for interfacing works among the contractors or other parties, provide the necessary information to contractors Step-7. When you get the revised schedules from contractors go back to Step-4, 5 and 6 and 7 accordingly. Make sure all projects have the same data date. Fix the broken links as the links done in Step -1 will be lost when you delete the existing WBS (shown in Step-6). You can have stand alone project once integrated. You need to re-links and reassign project calendar again when the revised schedules are imported. There is an easy way to work with multiple projects if the contractor’s schedules are not required to integrate into one and you just want to link contractor’s schedule ( as external links) and yours. The amount of work you are doing will be lesser than above method (copy and past activities). After Step-1, 2, 3, 4 and Step-5 (as described on above and as shown in process diagram) are done, you just need to link among the opened project interfaces. Then, assign the baseline and save a copy of back up schedule. When you received the revised schedule from contractor’s, go back to step 4 and import the projects. This is different from the above method that saves your time. 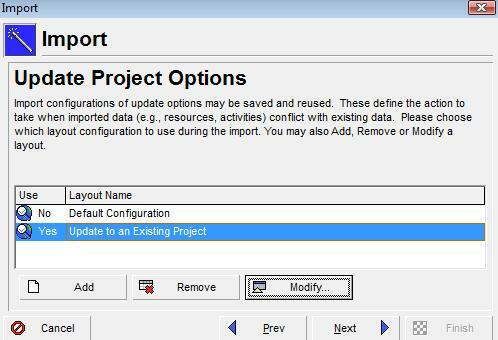 In the Import Project Options dialog box, choose Update Existing Project option under Import Action field. Click on Import To field to select the opened Project A that you want to update. In the next dialog box Update Project Options, Add a new configuration and name it as Update to an Existing Project. See figure below. Select the Update to an Existing Project and click on Modify tag to modify its default configuration as shown in the figure. In the Modify Import Configuration dialog box, select Update Existing option under Action field for Resource, Resource Codes and Calendars. To use that new configuration, remember to mark it “Yes” which is next to Update to an Existing Project layout configuration. Repeat the same process when the project B and C are being imported. After all contractor’s schedule are imported, check the new data. Make the necessary linkages if the new activities added that affect the successor activities among the projects. This method makes easier than the above method (Copy and Paste activities). It saves a lot of time when the subsequent updated schedules are imported. I need to import all my projects from one database to another with the baselines attached. How would I go about this in a simple manner?